Read more about Sacred Plants, by clicking on the image above. True healing puts into order the body, mind and spirit with the past, present and future. What kind of agent or method or formula or treatment can help to effect such sweeping, integrated healing? I offer for your consideration ayahuasca, a psychoactive potion indigenous to the Amazon rainforest. Made from the vine Banisteriopsis caapi (called caapi) and the leaf Psychotria viridis, (known as chakruna) ayahuasca is considered among natives in the Amazon to be a sacred plant medicine. Among those for whom the ceremonial healing use of ayahuasca is a way of life, the brew is referred to as “La Medicina,” meaning The Medicine. Ayahuasca ceremonies have become quite popular among non-natives over the past few years, as seekers worldwide have investigated non-ordinary forms of healing and spiritual exploration. Among participants are many medical doctors from the US and Europe. The vine Banisteriopsis caapi, also known as “the vine of the soul,” contains a group of compounds called harmala alkaloids. These compounds are MAO inhibitors. They prevent the activity of naturally-occurring agents in our bodies called monoamine oxidase. Think of MAO’s as doormen standing in front of the night club of your brain. Psychoactive compounds, notably the potent vision-inducing agent DMT, want to get into the club and attach themselves to your brain’s receptors. But the MAO doormen prevent this from happening. The harmala alkaloids in Banisteriopsis caapi, however, tell the doormen to take a nice log coffee break. They do. That’s when the Psychotria viridis, rich in DMT (N,N Dimethyl Tryptamine), comes into play. DMT is the most potent vision-inducing agent known. And oddly, DMT is not only found in many hundreds of plants all around the world, but it is also manufactured in our own bodies. But thanks to MAO’s, we do not trip on DMT all day long. While ayahuasca ceremonies vary from one shaman to another and from one tribal tradition to the next, certain features remain constant. According to the native explanation, a well-conducted ayahuasca ceremony brings together the ayahuasca brew, the shaman(s), and the plant spirits. This triune force effects healing, and opens up the doors of the spirit world to the participant.Typically an ounce or two of the brew is drunk. 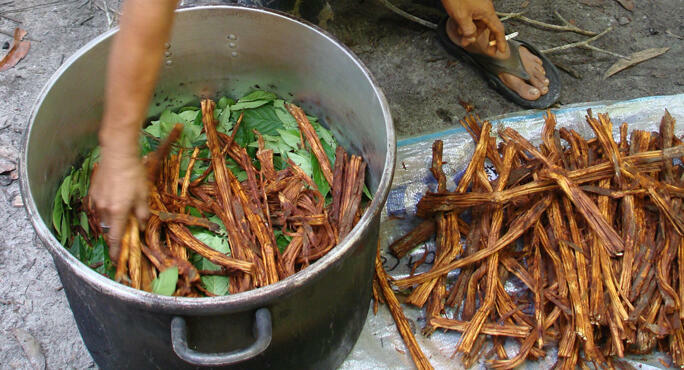 The ayahuasca brew is intensely bitter, and the taste is unpleasant, even for those who are experienced drinkers. In some ceremonies, the shaman(s) sit quietly with the participants in the dark for about forty-five minutes or so after drinking, as the effects of the ayahuasca start to come on. However, some shamans begin to sing and make ethereal whistling sounds as soon as the brew has been drunk. Some shamans wave chacapas — noisy leaf fans — and others do not. It is typical for the shaman to blow smoke of potent Amazonian tobacco (called mapacho) on participants, to cleanse the atmosphere and to establish an aura of protection. Within about an hour after drinking the brew, visions usually commence. There is a geometry common to the ayahuasca experience, and this geometry is beautifully represented in the textiles and ceramics of the Shipibo native people of Peru. Most people who journey with ayahuasca see that geometry. As the visions increase, the shaman(s) sing healing spirit songs known as icaros. These evocative, haunting tunes bring the traveler deeper into the ayahuasca mystery. There are many thousands of cases in which people have been healed of physical, mental and emotional disorders, and many curious cases of recovery from grave and even fatal disorders. There is much to investigate about the healing properties of ayahuasca. A large number of people have been cured of addictions through ayahuasca ceremonies, and the cases of post-ayahuasca cancer remission are too numerous to ignore. Researchers from all over the world are interested in ayahuasca, attempting to understand its healing properties. People see and experience all kinds of phenomena while on an ayahuasca journey. You may see deceased relatives, spirits of every kind, vast landscapes of natural or manufactured forms, animals, insects, serpents, birds, and various creatures of nature. And as you engage in ceremonies over time, you start to learn to negotiate the spirit landscape, and to enlist the aid of certain spirits for your own healing and spiritual awakening. I personally have brought several people to the Amazon for healing in ayahuasca ceremonies. One was healed of a four year long bout of chronic fatigue. Another was healed of an ongoing stomach problem. For the person who has never participated in an ayahuasca ceremony, it is easy to assume that the brew causes the drinker to hallucinate, and that this explains the ayahuasca experience. But when you have engaged in ayahuasca ceremonies with highly trained shamans who make the brew correctly, such a simplistic explanation falls apart completely. The spirit landscape, in all its mystery, beauty, splendor, terror, majesty and strangeness, is its own world, and the ayahuasca lets you into that world. Ayahuasca is clearly not for everybody, as the experience is typically intense. The spirit landscape is beautiful, but can also be overwhelming. Still, ayahuasca helps to put into order the body, mind and spirit with the past, present and future. Because of this extraordinary healing power, ayahuasca is a revered brew, and ayahuasca ceremonies are increasingly sought after by people from all over the world. Some flock to Peru, Brazil, Colombia and Ecuador to participate in ceremonines in the Amazon, and others drink in urban and suburban venues, in ceremonies led by shamans who tour. If you are interested in experiencing the potent healing effects of ayahuasca, I know of two places in the Peruvian Amazon where you can do this safely and with proper guidance. One wonderful place for ayahuasca ceremonies is the highly publicized and very comfortable Blue Morpho (www.bluemorphotours.com), run by guide American Hamilton Souther and master shaman don Alberto Torres Davila. Both men conduct the ceremonies, and both are extremely talented. I have also participated in ceremony with them, and cannot speak highly enough about it. Another new center is Nihue Rao Centro Espiritual (www.nihuerao.com) with the highly talented Shaman Ricardo, who trained extensively undershaman Guillermo Arevalo. In many ways, through a great many people, ayahuasca, La Medicina, is making itself known. This potent Amazon brew has the power not only to heal, but to transform your understanding and experience of reality.